Intense emotions among ancient caravan tracks and imposing dunes with changing colors. 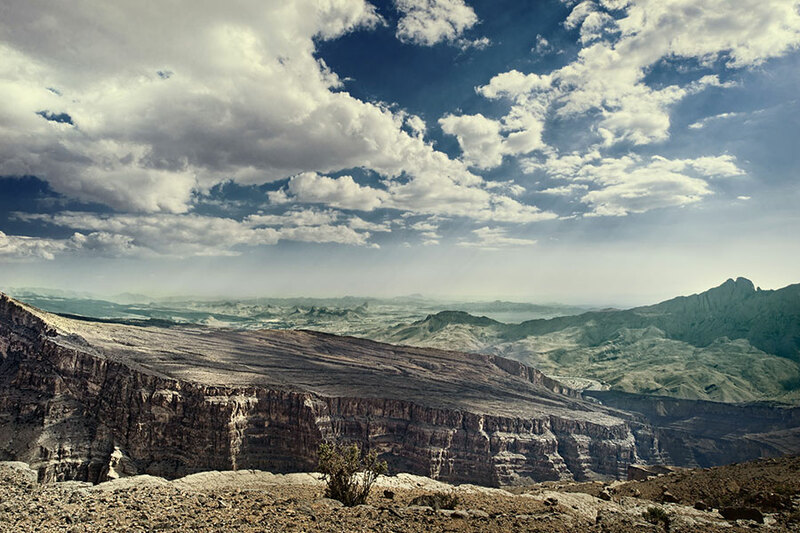 An unforgettable journey of eighteen days to appreciate the many sides of the country: the north mountainous between canyons and wadis, the cities of Bahla and Nizwa with their traditional forts, the desert bordering Saudi Arabia. 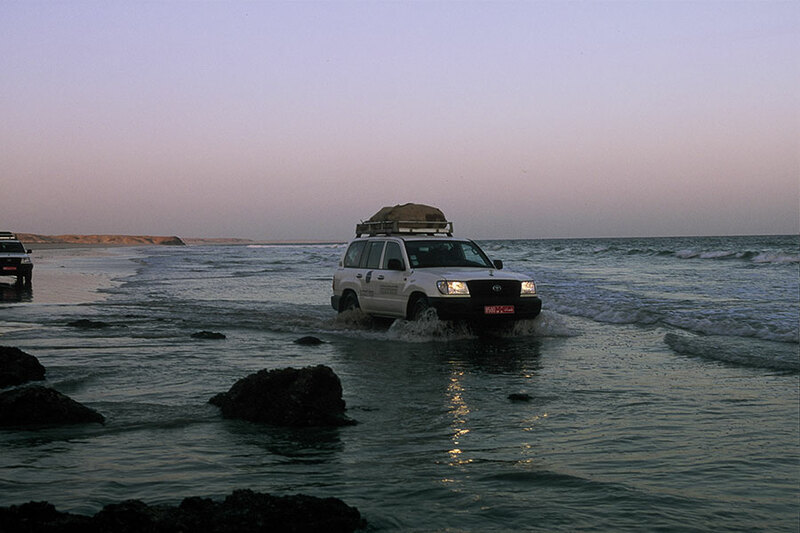 Among the scent of Salalah, an ancient outpost of the incense route, the beaches of the Indian Ocean, the bays and coasts of the north of the country we will visit unique sceneries, where the desert dunes seem to dive into the sea. Arrival in Muscat, meeting with the guide and transfer to the hotel for overnight. We will visit the Great Mosque ordered by the Sultan Qaboos, a splendid example of modern Islamic architecture: the impressive prayer hall for the rich decorations, the dome, the crystal chandelier and the 4,200 square meters Persian carpet. Departure with 4WD direction the North-West, towards the Hajar mountain range, whose marvelous sceneries culminate in 3,000 meters high peaks. 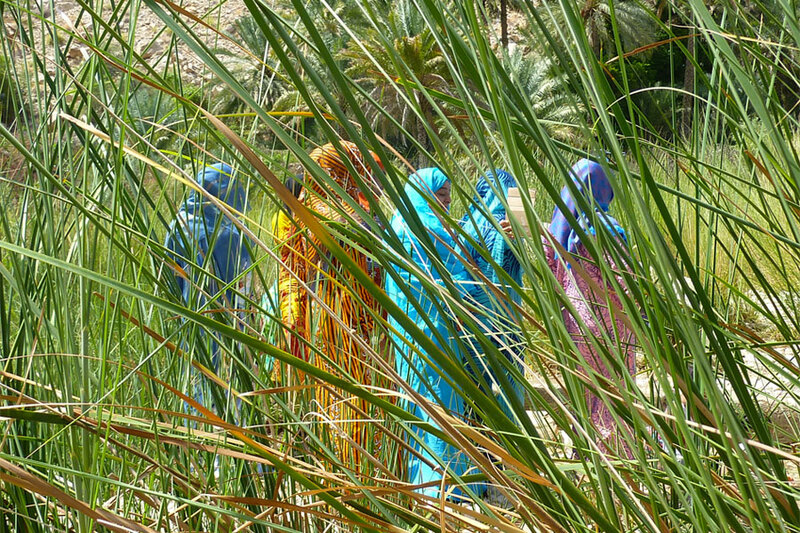 We will visit Wadi Bani Awf, with its bizarre morphology accentuated by the splendid color tones. After picnic lunch in the wadi we will reach a pick of over 2,000 m, with a superb view of the Hajar mountain range. Arrival in Jebel Shams in the afternoon, dinner and overnight at a mountain resort. After breakfast we proceed with the exploration of the Al Dakhiliyah Region, situated in the inland of the country rich in places of historical and cultural interest. We will visit two fascinating oases: Al Hamra, whose buildings are built with a mixture of mud and straw, and Misfat Al Abriyeen, with houses clinging to the rocks and micro parcels of cultivated land. In both oases, an extraordinary irrigation system distributes water from mountain springs to the plantations and to the inhabited area. After lunch in a restaurant, visit of the extraordinary Jabreen castle, with its splendid decorated ceilings. Afterwards, stop at the impressive fort of Bahla, entered by UNESCO among the world heritage of humanity. Arrival in Nizwa in the afternoon for dinner and overnight at the hotel. After breakfast, visit of Nizwa, the "Pearl of Islam", which was built on a plain surrounded by a thick oasis of palm trees, beautified with an interesting seventeenth century fort and its suq. Recently renovated, it is possible to find food and craft products: lecterns, ceramics from neighboring Bahla, incense burners, walking sticks, men headgears and much more. The city is also renowned for its silversmiths and for the expertise with which they make necklaces, rings, bracelets and jewelry. Typical are the khanjar, finely worked silver daggers. After the visits we leave Nizwa to reach the Ramlat at Umm Al Zamaym where, in the vicinity of Hayma, the camp will be set up for the night. Dinner and overnight in a tented camp. 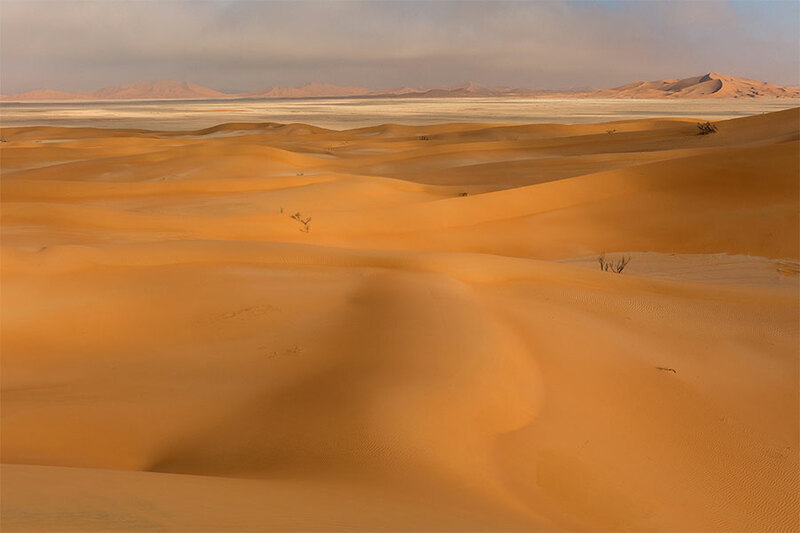 The Rub Al Khali is the vast desert that mainly occupies the territory of Saudi Arabia but that also extends in Oman, north of Yemen and the Emirates. The dunes are magnificent, of a color that goes from yellow to red depending on the time of day. The first dunes are often separated by white basins, evidence of an ancient sea bed. Along the tracks meet minerals and desert roses. 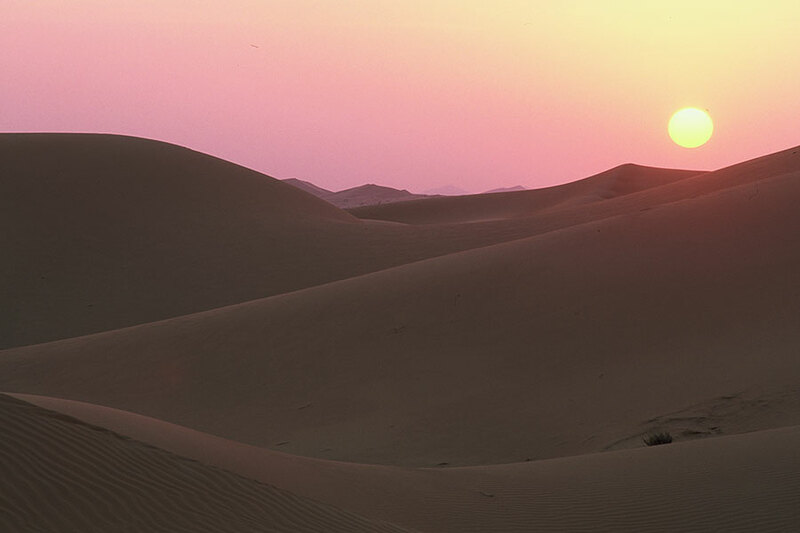 The more you go into the Rub al Khali, the more dunes become imposing and united. It is possible that there are cover-ups: in this case, the help of the participants is very welcome! Overnight in camps in the desert, under the stars. 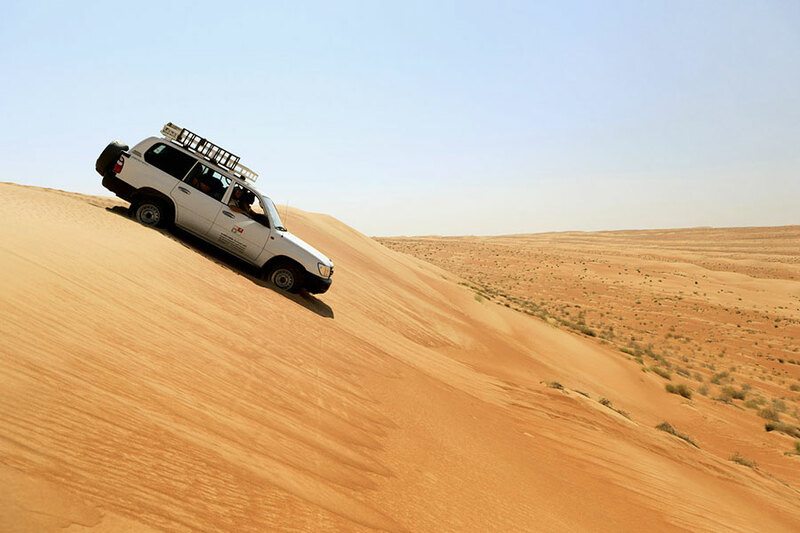 After breakfast we leave the Rub Al Khali to reach the village of Al Hashman, on the edge of the great desert. First stop at the ruins of Ubar (today Shir), the Atlantis of the sands, famous in ancient times for the trade of incense. 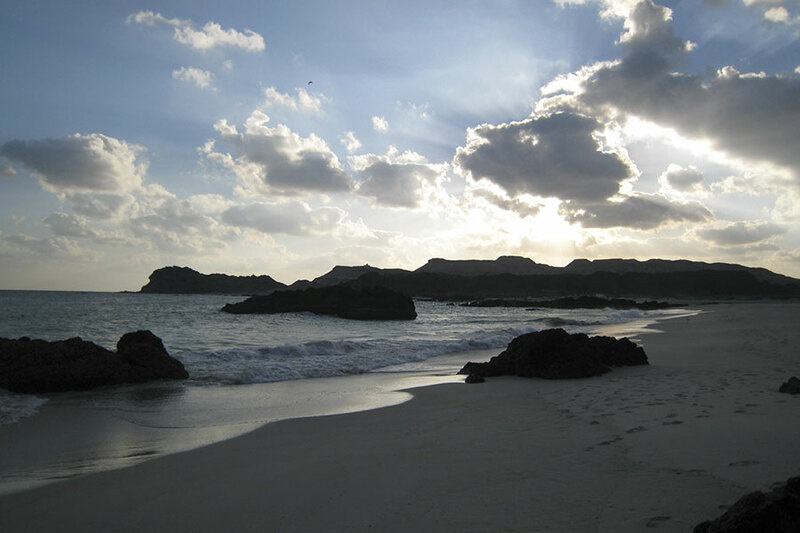 Afterwards we will continue to the modern Salalah crossing the Dhofar mountains; picnic lunch or at a local restaurant. At the city, we will arrive in the hotel for dinner and overnight. In the morning, with a minibus, we will head east through coconut groves, then along the coast to Taqa beach. 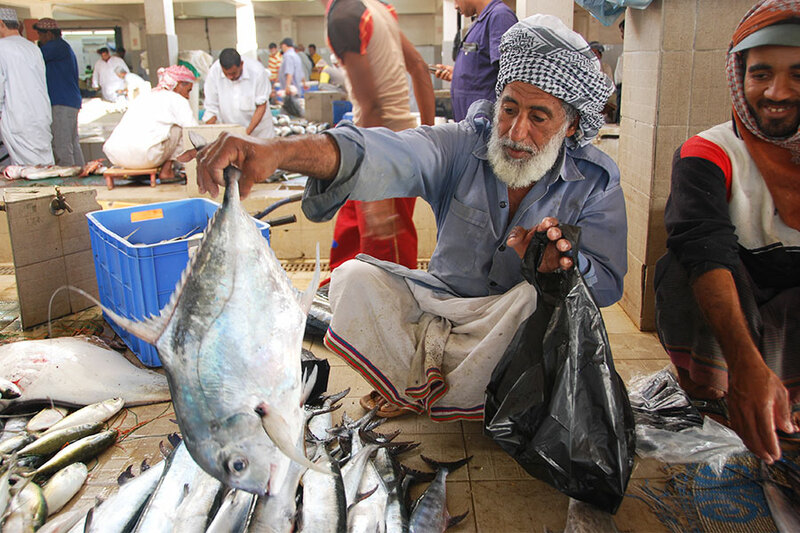 Afterwards, we will stop at the fishing village of Mirbat. 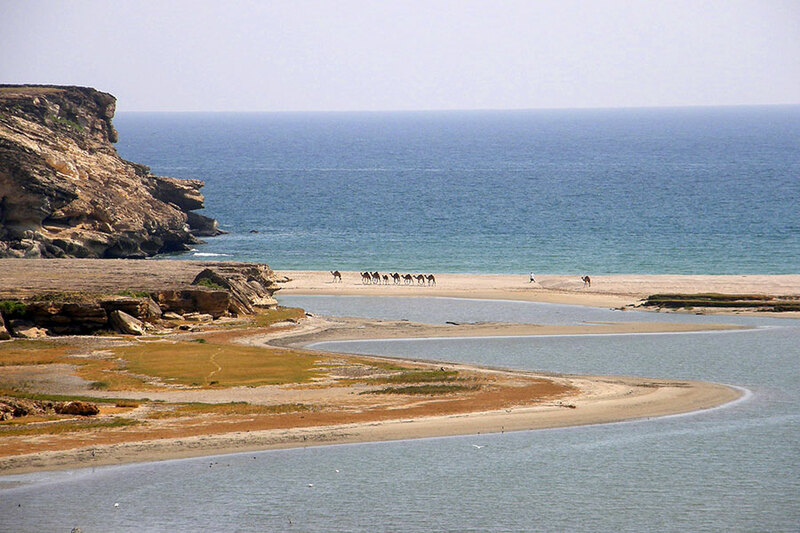 Returning to Salalah, the real surprise will be Khor Rori, a large desert inlet separated from the sea by a strip of sand: in the middle, on a rocky outcrop, are the ruins of Sumhuram, the ancient Roman Abyssopolis, collection point and sorting of the incense that, from the sea, was sent throughout the Mediterranean. Not far away, at the edge of the bay, there are large rushes where herons and flamingos come to rest. Back to the hotel in Salalah. Here, in the afternoon we will visit the Al Balid museum and the interesting suq, where you can buy the original Dhofar incense, considered the best in the world, and its decorated incense. Departure from Salalah taking the direction towards east. We will cross the mountainous landscape of the Jebel Samhan, the great massif mountain surrounded by the plains of Salalah, and barren highlands with deep wadis. 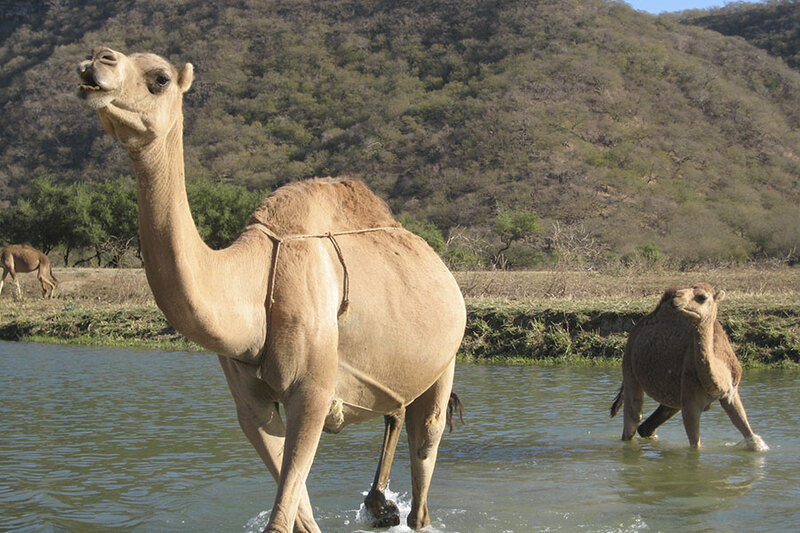 Along the way you will meet the caravans of nomadic Jabali camels and acacia trees whose bright green creates a beautiful contrast with the bleak surrounding landscape. We will plant the first camp in the verdant Wadi Salafan, where we will be able to admire numerous camels grazing free. The next morning we will continue the journey to the coast of the ocean and we will reach the Wadi Shuwamiyah, a spectacular canyon with high cliffs of white limestone and ocher. Here, inside the canyon, we will set up the camp for the night. After breakfast we will take the 4WD vehicles and the asphalt road to the north, parallel to the ocean coast. We will then leave the route to travel on an interminable beach, populated only by crabs and birds, a few meters from the waves *. Here, in front of the waves and under the stars, we will set up our camp for the night. * In case of high tide, the route will be made further from the sea. In the morning, after an enjoyable walk on the deserted beach, we will continue the 4WD drive along the coast towards wonderful beaches where the fragments of millions of shells give the sand a suggestive pink shade. 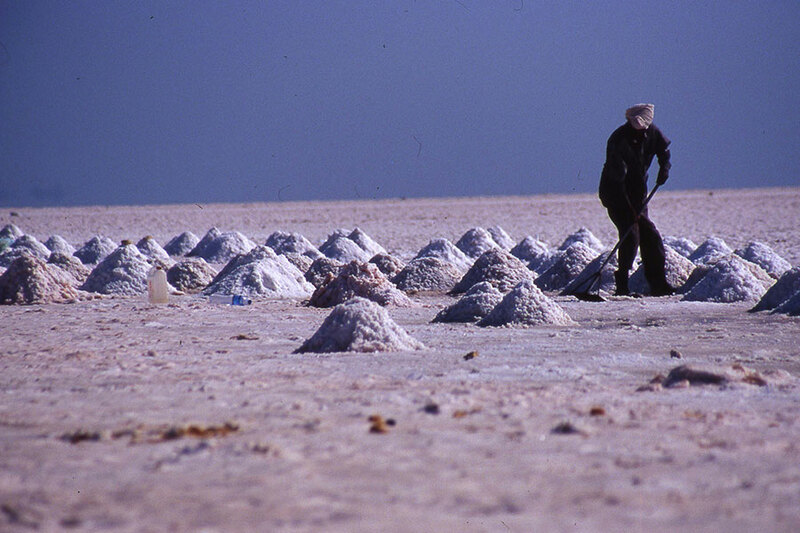 The trip will continue with swimming in the crystal clear waters of small hidden bays and visiting the wild Bar Al Hikman peninsula, characterized by extensive plains of salt that create curious optical effects. Before camping on the beach for the night, we will visit uninhabited beaches, destination of numerous colonies of pink flamingos. 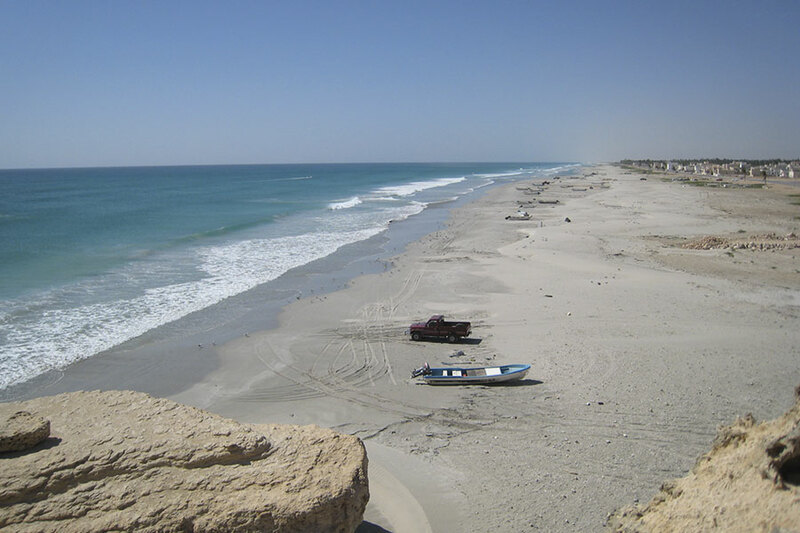 From Bar Al Hikman we will leave for Masirah, a large island about 70 km long and 18 wide, located just 20 km from the coast. About 8,000 people live here, most of which are in the main village of Ras Hilf, where ferries dock. Inhabited since antiquity, Alexander the Great founded Serepsis here, one of the bases of his vast empire. We will circumnavigate the island stopping for a picnic lunch and there will sure have the opportunity for swimming in the sea, to admire the numerous species of birds and to discover the uncontaminated nature. After the second night on the island, in the morning we will return to the coast by ferry. 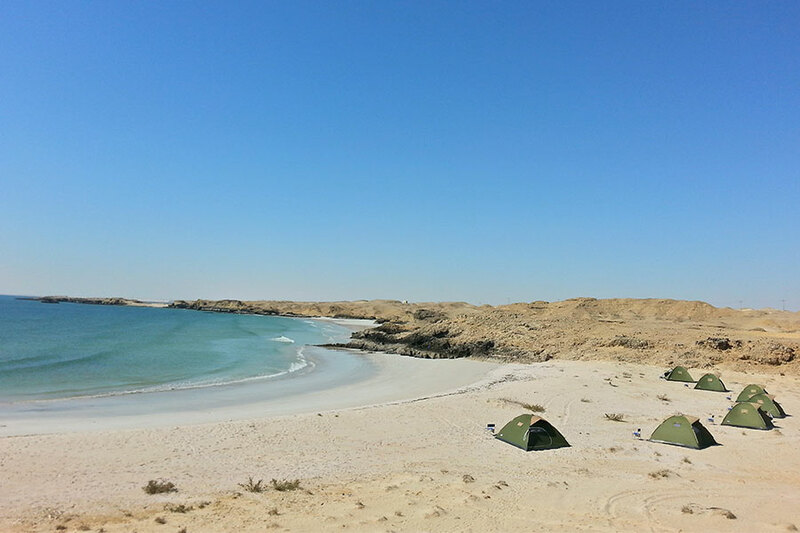 Back on the road again until you will reach some dunes of the Sharqiyah that fall into the sea. Lunch in a local restaurant and arrival in Ras Al Haad in the afternoon. Here we will reach the most eastern point of the Arabian peninsula: Ras Al Haad and Ras Al Jinz, which form a vast protected natural area where huge green turtles lay their eggs. Accommodation at a beach resort and, after dinner, visit the National Turtle Park. Return to the resort and overnight. A beautiful road will lead us to Sur, an enchanting town surrounded in a natural bay, where the harbor district is still in traditional style. Visit the shipyard of the dhows, the typical wooden boats that have always crossed the seas of Arabia and that still today are used for fishing and for small businesses with Iran and Pakistan. We will continue towards the coast following a scenic road that runs between mountains and sea. We will stop to visit the ruins of the city of Qalhat, founded in the 2nd century BC. It was an important port during the medieval period of the southern Arab kingdoms, also visited by Marco Polo during his travels in the East. Entering in Wadi Tiwi, a canyon with imposing rock faces alternating terraced palm groves and villages will be a memorable experience. After a picnic lunch, back to Muscat, where we will arrive in the afternoon. Free morning and free lunch. In the afternoon, tour of the capital. We will reach the Old Muscat area, home of the Alam Palace, the official palace of His Majesty the Sultan, and the two Portuguese forts of the sixteenth century, Al Jalali and Al Mirani. Following, visit the Muttrah souq, the traditional market where you can buy beautiful Omani crafts: silver objects and jewelry, the typical khanjar daggers, spices, various incense fragrances, pashminas, wooden objects and much more. Dinner with fish in a restaurant, transfer to the airport and departure for Italy. The mountains are rich in fossils and prehistoric rock engravings to witness ancient human settlements. But what are most astonishing views are sudden wild valleys that are lost towards the blue sea. At the end of the afternoon, back to Khasab. Although Al Koor Tourism is committed to ensuring maximum customer satisfaction, it may not be possible to provide part or all of the services listed in case of events or circumstances beyond our control (ex: adverse weather conditions, natural hazards, causes of force majeure etc.). Deviations and changes to the original program could also be requested in the event of road breaks. Al Koor Tourism can not be held responsible in any way for any material or economic damage, or any request by the customer for non-service due to events and circumstances described above. N.B: the technical equipment during the shipments includes GPS satellite navigation instruments and satellite phone.